The emperor penguin is the most familiar of the 17 penguin species in the world, and it is also the largest, weighing in at up to 90 pounds. That extreme weight is essential since the birds are not able to feed for up to two months while incubating their single egg; instead, they live off their fat reserves. Markings: Genders are similar with black or silver head, back and wings that may be darker at the shoulder and along the edge of the dark plumage. The chest and abdomen are white with yellow beneath the chin. There is a blended yellow and white ear patch darker at the tip, and the birds have dark gray-black feet. Males are heavier than females. Juveniles are initially covered with fluffy, light gray down with a white face and black head, but as they grow their down turns muddy brown until it is shed as they molt into adult plumage. Emperor penguins can be found along the coast of Antarctica on ice shelves as well as in the sea, where they spend a good deal of time hunting. These birds have a short term migration between nesting colonies and the sea for feeding, but they stay year round in Antarctica, enduring temperatures as cold as -80 degrees Fahrenheit (-62 degrees Celsius). Nesting colonies are typically found near iceberg and rock outcroppings that provide some shelter from Antarctic winds. Sound is crucial for emperor penguins to identify one another, both as chicks and adults, and they have the widest call variations of any penguin species. Typical calls include raspy “craaaaal” sounds, whistles and ululations. Emperor penguins are very social birds and form colonies that routinely include thousands of birds. During the harsh winters, the birds will huddle together for warmth, often shifting positions so different birds are on the colder edge of the huddle at different times. They may also change their posture to scrunch down and better preserve body heat. While hunting, these birds are agile, powerful swimmers and can dive up to 1,600 feet below the surface where they can stay submerged for up to 20 minutes. On land, they often use tobogganing to slide more quickly along the ice, using their flippers and feet to help propel them along. This allows them to move more quickly than their short, stubby legs can walk. Like all penguins, emperor penguins are flightless. These are monogamous birds that produce a single pale white egg annually, but they do not construct any type of nest. Instead, the male parents will incubate their egg by holding it on their feet and covering it with a brood pouch for 62-67 days, going without food themselves while the females migrate to the sea to hunt. After the chicks hatch and the females return, both parents work to rear the hatchling, alternating hunting and parental care periods. 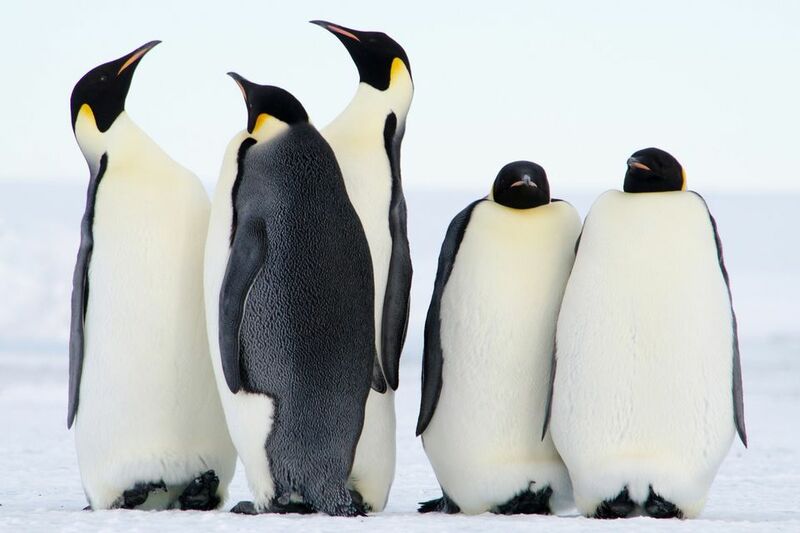 As chicks age, they may be left in a communal flock of young emperor penguins with several adult guardians, while both parents leave to hunt. This species is one of only two penguin species that incubate eggs during Antarctic winters, the other being the Adelie penguin. These are obviously not backyard birds, but they are common in zoos and aquariums around the world. Birders who want more personal experience with emperor penguins can visit them in captivity, and many penguin-friendly facilities offer behind-the-scenes tours or meet-and-greet options for closer interaction. It is also possible for birders to plan a trip to see these penguins in their native habitat. The species is very sensitive to climate changes that affect their Antarctic habitat, which can change the layout of the ice they rely on for nesting. Changes in water temperatures and currents can also dramatically impact the availability of suitable prey. Emperor penguins also suffer from predation by petrels and skuas that will eat eggs and chicks, as well as leopard seals and orcas that kill adult penguins.